My next Christmas read is Joe & Clara’s Christmas Countdown by Katey Lovell. This is set very firmly in the festive season with the exception of the prologue. Clara works in a local youth centre in Manchester which provides vital services for the young people in the area. As with many such services, the centre is struggling for funds and volunteers. However, new volunteer Joe looks like he could be the answer to some of their problems and in centre manager Deirdre’s view, he could also be the perfect man for Clara! Clara has had her heart broken by footballer and ex-fiancee Dean and has sworn off men. She is, however, a massive fan of Christmas. The festive season for Joe though brings back sad memories of a tragedy which happened just before Christmas 8 years ago. They make a pact and agree on a Christmas Countdown: Clara will give Joe gifts to try to remind him that Christmas can be magical and Joe will take Clara out, as a friend, to remind her that she can enjoy the company of men. Each chapter covers one day and alternates between the points of view of Joe and Clara. Can I just say first how much I love that cover? It’s simple yet eye-catching and effective. And I also really enjoyed the story in between. You may well feel you know exactly how the story will end but sometimes that isn’t a bad thing. The joy of reading is wondering what path the author will lead you along to get to that point. Joe and Clara were both really interesting characters. They were both caring and compassionate people who deserved to have happiness in their own lives but, as becomes understandable as you read, they both have very good reasons for being wary of love. Throughout the story the author brings current social issues into the story too with mention of families needing to access foodbanks, under-funding of important services, and she shows the importance of places for young people to go and have positive influences especially in less affluent areas. That perhaps sounds like it might be a bit preachy and heavy going but it isn’t really, just a natural part of the story given the importance of the Youth Club and the young people who use it. Joe & Clara’s Christmas Countdown is a very sweet story which shows the magic of Christmas working in the lives of these two people. It is one of these books which will leave you with a contented sigh at the end and one to add to your Christmas reading list. My thanks to the publishers Harper Impulse for my review copy of the book via Netgalley. 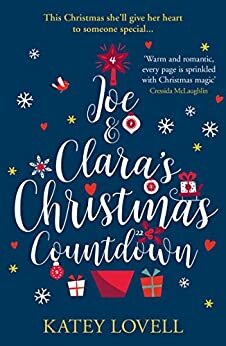 Joe & Clara’s Christmas Countdown is available now as an ebook (order a copy online here) and the paperback version will be published on 30 November. Check out the book, Joe & Clara’s Christmas Countdown, by Katey Lovell, as featured on the Portobello Book Blog.